I was driving home last week talking (hands free, mind you) to a friend over in Charleston who informed me that he was considering a getaway to Stone Mountain… in North Carolina. To a native Atlantan like me that last sentence didn’t make any sense because we all know that Stone Mountain is clearly in Georgia – I mean, it’s essentially a part of Atlanta, only 16 miles to the east of downtown. 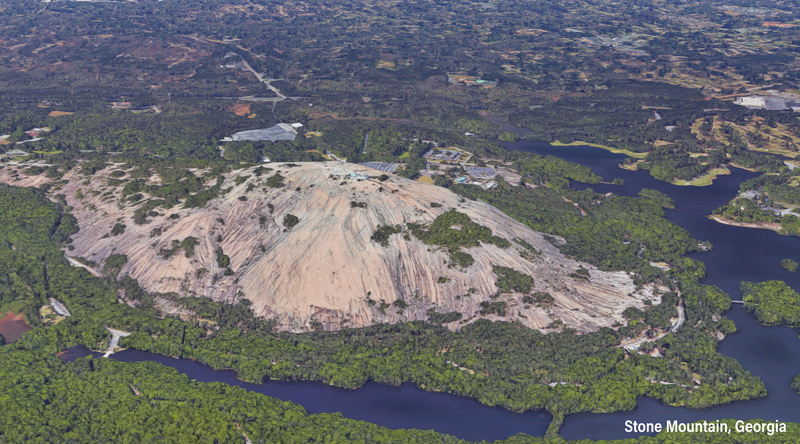 Rising nearly 800 feet above the surrounding countryside, this dome of exposed granite stands out from the sea of surrounding trees and the quaint town of Stone Mountain, Georgia. Stone Mountain has long been on the list of places where Atlanta families planned summer day trips. Once you’ve been to Stone Mountain Park and made the breathless walk/climb to the top you know that there is nothing else like it in the world. Except that there is, and it’s apparently just a five and a half hour drive away. Meet Stone Mountain, North Carolina. This should look pretty familiar to Georgia residents. Stone Mountain (NC) is the centerpiece of Stone Mountain State Park, and is also a massive dome of exposed granite rising about 600 feet above the surrounding terrain. 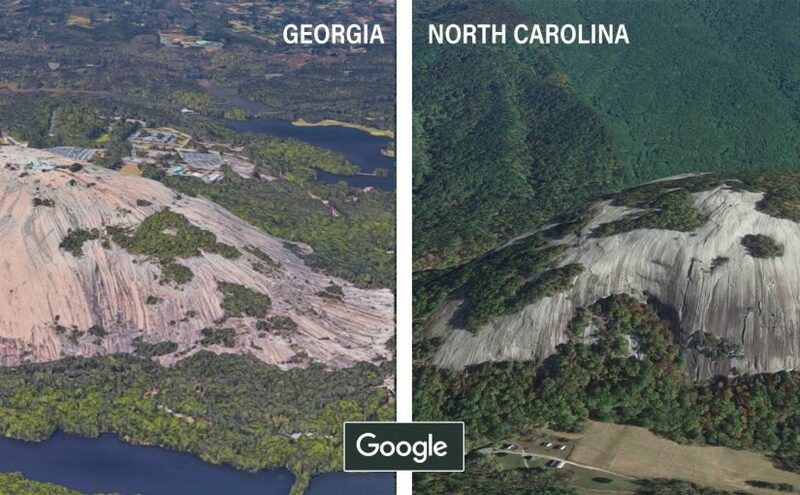 Once you spend a good chunk of time comparing the Wikipedia pages of Stone Mountain (GA) and Stone Mountain (NC) you may realize how remarkably uninformed we are about the geology of our own planet. You could say that we really take this place for granite… get it?? 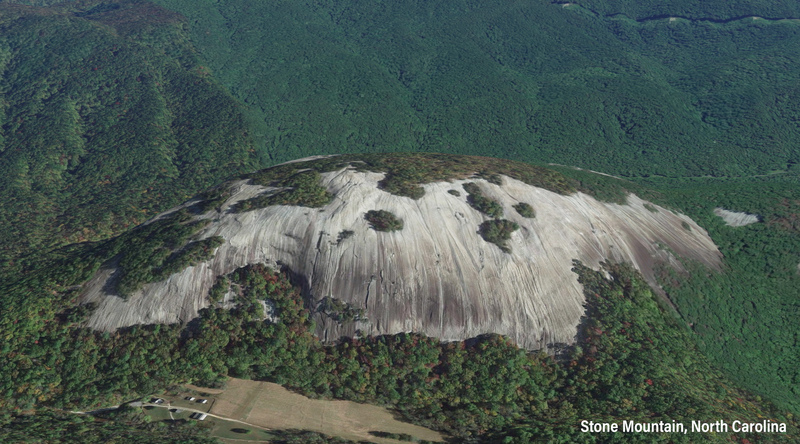 Georgia’s Stone Mountain is larger and is not engaged in a series of ridges like its cousin in North Carolina. The Georgia version is bordered by an actual city (named Stone Mountain, Georgia) and is part of a well developed park featuring a wide variety of attractions (www.stonemountainpark.com). Each of these Stone Mountains are examples of a geologic feature known as a “plutonic monadnock”, which is just a fancy way of saying a really really big rock that was formed underground by crystalizing lava, which then solidified into a single mass (a “pluton“) and was eventually exposed to the atmosphere after the land (or mountain) above it eroded away, leaving it as the only giant rock in the surrounding landscape (a “monadnock”). Monadnock is word from the Abenaki First Nation people, meaning a lone hill that stands above the surrounding area. These features are also referred to as an “inselberg” by geologists – rabbit hole of geology unto itself, which you are welcome to dive down anytime you like. Suffice to say that there are more of these geological remnants of ancient reservoirs of magma scattered around the planet, some of which are millions of years away from seeing the light of day. 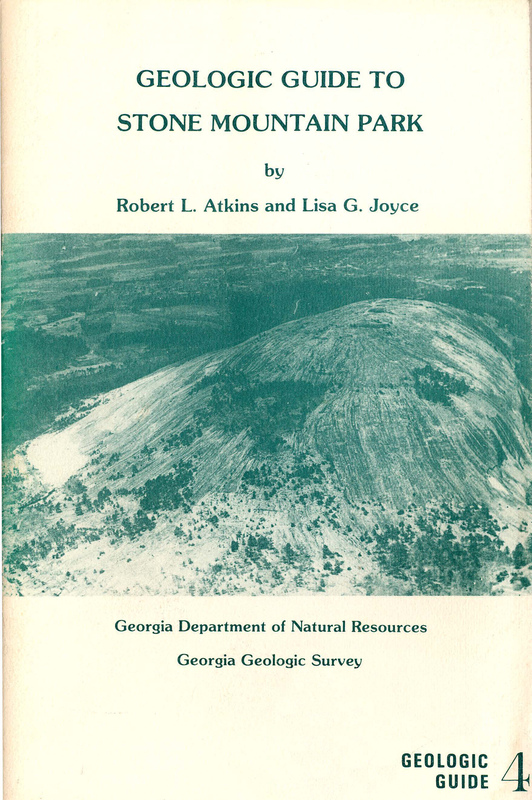 One of the neatest things I ran across while trying to understand our Stone Mountain’s doppelgänger was a PDF of a book that was published by the State of Georgia in 1980, written by Robert L. Atkins and Lisa G. Joyce, of the Georgia Department of Natural Resources. The book is currently hosted on the Environmental Protection Division area on the State of Georgia’s principal website. I have made a mirror copy of that PDF available here for you to download and peruse on your own (Download PDF: GG4-stone-mountain-facts) – thank to all who originally made this book available! Hope this helps widen your eyes about the world we all take for granted. Have you been to both parks? How do they compare? Got a line on other monadnocks in the southeast worth seeing?